Cooking With Le Creuset – What makes it special? First off, Le Creuset have been making first class cookware for almost 100 years, and while they have expanded exponentially and taken advantage of technological advances, their method for manufacturing cast iron cookware remains the same as it was in 1925; it is amazing to see the traditional hand-crafted technique of the original forging and casting process. Cast iron cookware can be used on all heat sources; gas, electric solid or radiant plates, vitroceramic glass, induction, and ranges fired by gas, oil, coal or wood. 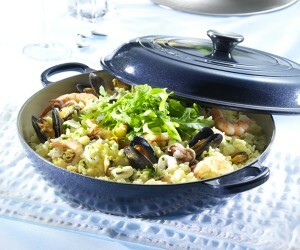 The enamel on Le Creuset products is highly durable, hygienic and shock resistant. Ideally, your cooking utensils should be made of an inert substance that does not peel, chip, crack, craze, vaporize, dissolve or harbour bacteria. 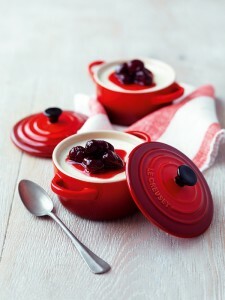 The unique enamel finish on Le Creuset Cast Iron products not only ticks all of the durability boxes (it has a lifetime guarantee to prove it), but also overcomes hygiene worries. According to a team of researchers from the University of Southampton, stainless steel cookware, overtime, can develop scratches that, on a microscopic level, are the equivalent of valleys where all the little germs live! Therefore if you are worried about food hygiene or find you use your cookware excessively, the extremely solid enamel finish on the Cast Iron and Stoneware products will give you peace of mind. 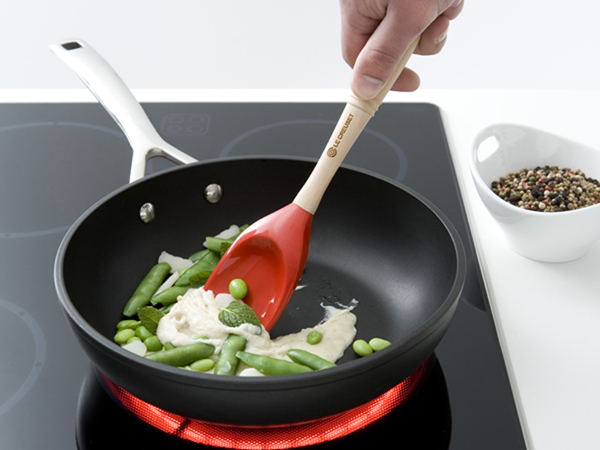 Don’t forget, Le Creuset also produce Toughened Non-Stick Saucepans (above), that are not only PFOA-free (a synthetic chemical compound usually used in non-stick pans), but also have a special reinforced hardened body to create a durable, long-lasting pan that’s tough enough to withstand even metal utensils – meaning no ‘germ valleys’! Cooking with Le Creuset may be a little different to what you initially assume. At first glance, Le Creuset cookware struck me as a bit of a one trick pony – being unaware of its potential uses, I could only envisage cooking stews or ‘hot pot’ dishes, but quite the contrary – the options are limitless! Cast iron is one of the best heat conductors and is known for being able to withstand and maintain extremely high temperatures. 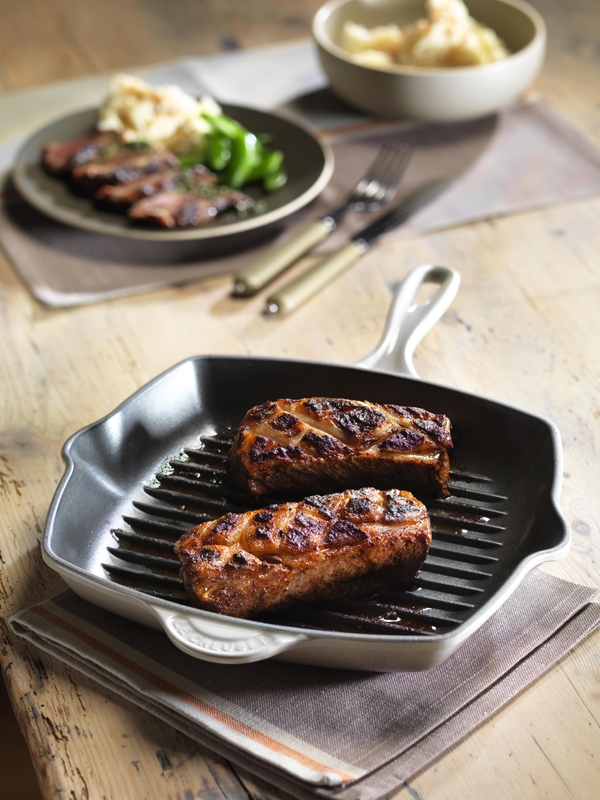 With Le Creuset, you get all the benefits of cast iron without the hassle of seasoning or cleaning difficulties. Yes, cast iron is perfect for long-cook dishes such as stews and hot pots due to its excellent heat retention, but you are in no way limited to those dishes. 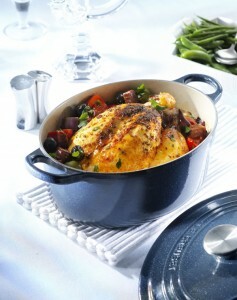 Roasting meat (Lamb or Chicken as in the pictures) in the Cast Iron Oval Casserole can turn out delectable! You can throw in the veg too and leave it to perfectly roast. The Shallow Cast Iron Casserole can be used to make a delicious roasted trout – the best thing is you can brown the trout and potatoes on the hob first then pop straight in the oven to roast through! Also, look at this beautiful risotto done in the Shallow Casserole – delicious! Surprisingly, Le Creuset Cast Iron Casseroles are also amazing for baking bread! You do need to oil the base and sides of the Cast Iron Round Casserole slightly and cover with a light dusting of flour, then leave it to rise in the dish and bake in the dish; the heat retention properties of cast iron aids the speed and evenness of the baking, creating a beautiful bake. Don’t get me started on the mouth-watering meals you can make with the Cast Iron Grillits! Everything tastes great chargrilled, but steaks, chicken, fish and vegetables done in these grills are on another level! 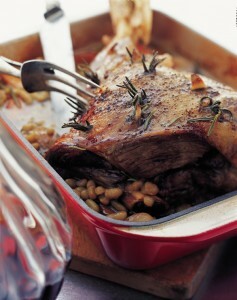 Like this lamb, meat goes crisp and chargrilled on the edges while staying moist and tender inside…perfect! 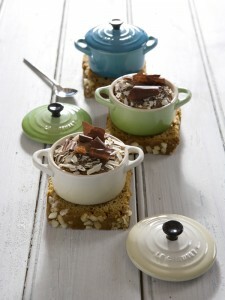 The Le Creuset Stoneware range offers great looking cookware straight from the oven to the table. I find it’s easier to maintain, as your average baking trays can be more difficult to clean. Being chip, crack and stain resistant helps too, and the 5 year guarantee (although not as long as cast iron) is a huge bonus. Le Creuset Stoneware is suitable for use in the oven, microwave, grill and freezer, while not absorbing odours or flavours. 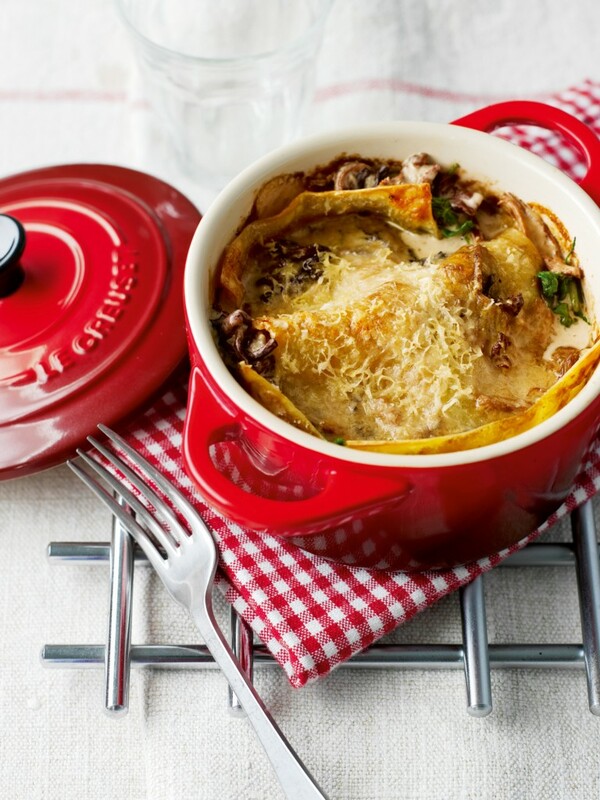 I love the idea of making individual lasagnes in the 14cm Casserole dishes like below; how great is it that you can just pop them in the freezer? Stoneware is also great for serving; you could use the 14cm Round Casseroles for fondue, nuts, crisps, dips and fruit, as well as your side dishes. Imagine everyone that comes for dinner having their own personal cauliflower cheese, selection of veg or pot of sauce! 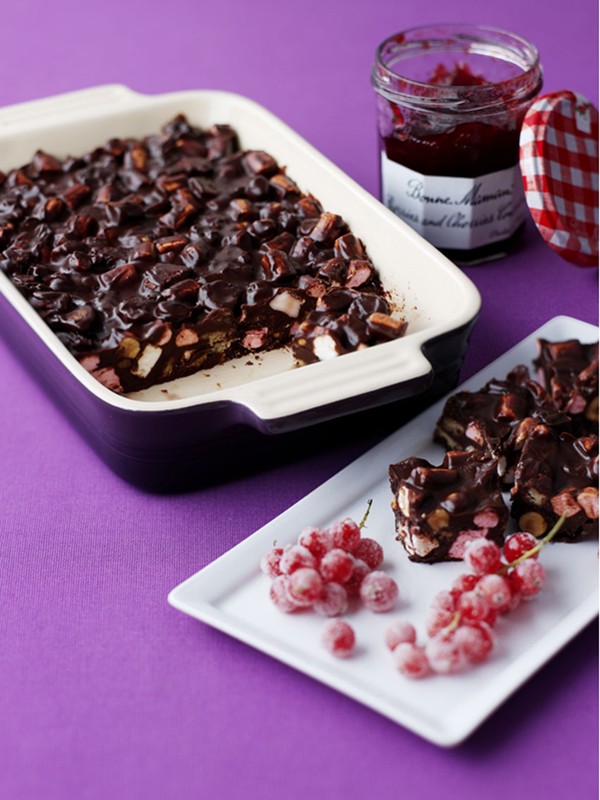 Being a pudding girl myself, I’m definitely using my Stoneware dishes to make this drool-worthy Rocky Road; it looks super easy and very scrumptious! I can honestly say that Le Cresuet is the only cookware I now use, apart from the odd dodgy chip baking tray, once you go Le Creuset, you don’t go back! Seriously, it really brightens up the cooking, and if you’re a little OCD like me, it means you can keep all of your cookware the same style and colour. High heats should only be used for boiling water for vegetables or pasta, or for reducing the consistency of stocks and sauces. High heats should never be used to pre-heat a pan before lowering the heat for cooking. Cast iron retains heat so well that if a pan is overheated in this way it will contribute to poor cooking results, sticking and discolouration of cooking surfaces. Try to use silicone, heat resistant plastic or wooden utensils as, especially for the price, you want your cookware to last as long as possible and maintain optimum look and functionality. Metal utensils can sometimes leave silver trail marks on the enamel, which you definitely don’t want on your lovely Le Creuset! cast iron, Cleaning Le Creuset, Cleaning Tips, cooking, Cooking Ideas, Cooking Tips, Enamel Cast Iron, Good Food, Le Creuset, Le Creuset cast iron, Le Creuset Cast Iron Casseroles, Le Creuset Grillits, Le Creuset Non-Stick Pans, Le Creuset Stoneware, Non-Stick Pans, Oval Casseroles, Round Casseroles, Shallow Casseroles, stoneware, Toughened Non-Stick Saucepans. Bookmark. WIN a Barbour Liddesdale Jacket in our Twitter Competition! Hi, how does one decide when to use the nonstick toughened pots & pans and cast iron pots and pans? All pots and pans can be used for pretty much any cooking it’s just down to personal preference. However, not all pots and pans are oven proof so careful decisions need to be made when cooking, for example if a casserole is being slow cooked a cast iron casserole pot would be used. If vegetables are being boiled a cast iron saucepan or a non-stick pan can be used.